In most cell types, thirteen protofilaments associate laterally to form a microtubule. In a few cases microtubules contain more or fewer protofilaments . Numerous interactions between the subunits give microtubules their stiffness and resistance to bending forces. The lateral interactions between protofilaments are however comparatively weak and as a result the plus end of microtubules frequently have a ‘frayed’ appearance . (A) The intracellular concentration of tubulin found in most cells (10-20µM) favors microtubule assembly at the plus end. This end may appear frayed in slow growing filaments due to fewer lateral interactions between the protofilaments and because GDP-tubulin dimers have an inherent curve. 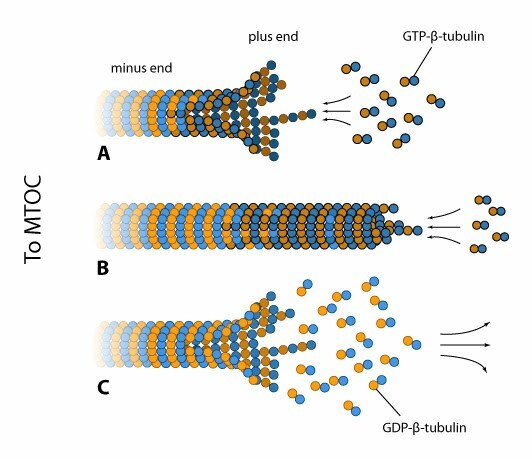 (B) At high free GTP-tubulin dimer concentrations, hydrolysis is outpaced by rapid assembly at the plus end, thereby forming a rigid GTP-cap. (C) Concerted GTP hydrolysis at the plus end weakens the tubulin dimer interactions and the protofilaments rapidly disassemble. Microtubules are highly dynamic and will frequently grow and shrink at a rapid yet constant rate. During this phenomenon, known as ‘dynamic instability’, tubulin subunits will both associate and dissociate from the plus end of the protofilament . A number of factors regulate the dynamics of microtubule formation however the primary determinant of whether microtubules grow or shrink is the rate of GTP hydrolysis, a factor that is both intrinsic and essential to filament assembly . In their stable state microtubles are hollow, cylindrical structures predominately composed of GDP-bound β-tubulin protofilaments. As GTP-bound protofilaments are straight, with multiple lateral contacts, assembly into the final cylindrical conformation is therefore dependent upon GTP hydrolysis. Without this, assembly would result in a flat sheet-like lattice of tubulin protofilaments. Whilst GTP hyodrolysis of β-tubulin is therefore essential in filament production, it must be noted that the rate of assembly will often outpace the rate of hydrolysis. When this occurs a blunt end or GTP-cap is produced, which effectively constrains the curvature of the protofilaments .When hydrolysis does occur, the constraint is removed and the protofilaments become highly unstable as the stored energy in the lattice is released. 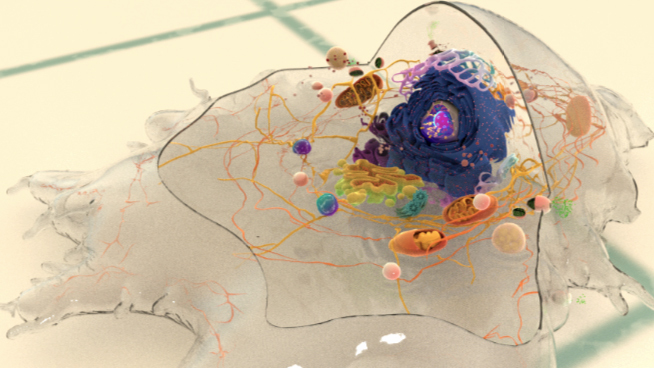 This results in rapid shrinking of the microtubule. A typical microtubule will fluctuate every few minutes between growing and shrinking. Although most microtubule growth and shrinkage occurs at the plus end, it can also occur at the minus end. Certain proteins sever and break microtubules (e.g. katanin) , whilst other proteins control microtubule disassembly by binding to and destabilizing the lattice (e.g. kinesin-13)  and promoting GTP hydrolysis on β-tubulin (e.g. Op18/stathmin) . These proteins require molecules such as ATP to provide the energy needed for subunit removal and their activity can be controlled by kinase-mediated phosphorylation.